Some of Voice Dream Writers most helpful features can be found in the right sidebar menu. First is a dictionary which can read back the definitions of a word (This feature is currently not available in Voice Dream Reader without using VoiceOver). The second tool allows users to enter a word spelled phonetically to find the correctly spelled option. For example, if I typed "receat," it might suggest the word "receipt," as an option. Unlike some other apps, these suggestions are not made based on the context of the surrounding text. Users can tap on each suggestion to hear the word spoken aloud. This feature is extremely helpful for poor spellers, especially when they are in a situation where using dictation would be inappropriate or unavailable. The last feature on the right sidebar is the option to look up a word by meaning. For example, if I was writing about organizations which donate money to charities, but could not think of the word "philanthropic" I could search "donate money" and "philanthropic" would be one of the suggestions. This can help reduce instances of a word being at the tip of your tong, but you can quite think of the word. In the left sidebar menu is an outline view. Users can select to view an outline of their document by heading, paragraph, or sentence. Users can then simply rearrange paragraphs or headings by dragging and dropping. This is helpful for the planning stages of writing as users can plan different paragraphs and fill in the content after they are finished planning. All formatting in Voice Dream Writer is done using markdown. This means that all editing is done in plain text, but symbols inserted before or after words cause the words to be formatted when the file is exported. For example, adding a # or * before a word will cause that word to be formatted as a heading or as italic font when exported. This system has some positives and some negatives over conventional formatting that is found in Microsoft Word and Apple's Pages. For blind users this system can be helpful because the special characters such as # and * will be spoken allowing them to quickly recognize when a portion of text is bold or italics. In other word processors italics and bold text may be read normally making it more difficult for blind users to determine how the document is formatted. However, for sighted users this system may be unfamiliar and therefore more difficult. It would be nice if Voice Dream Writer had both the option of using markdown and for editing in rich text and allowed the users to decide which option worked best for their needs. Finally, Voice Dream Writer includes a new innovation which improves the text selection and cursor movement process for VoiceOver users. These tasks are normally difficult for VoiceOver users. VoiceOver is a built in screen reader available on iOS devices that allows blind and visually impaired users to use gestures in order to use their device. When VoiceOver is enabled, Voice Dream Writer automatically adds three buttons to the bottom left of the screen. The first button controls the cursor and accepts a combination of multi-figure taps and swipes to move the cursor forward and backwards through the document. The second button adjusts how much the cursor moves with each swipe of the first button. 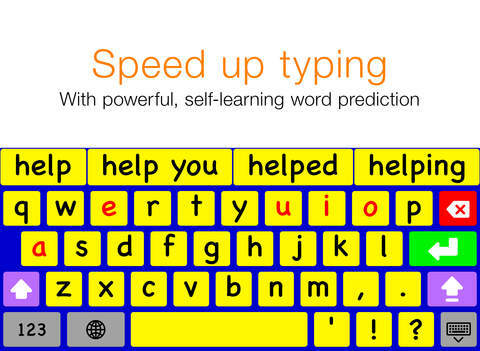 This button allows the cursor to move letter-by-letter, word-by-word, sentence-by-sentence or paragraph-by-paragraph. The third button allows users to easily select text and then copy or cut that text. This system of selecting text and moving the cursor with VoiceOver is much faster than the method used in other apps and is a major benefit of Voice Dream Writer for VoiceOver users. Voice Dream Writer is available for all iOS devices running iOS 8 and higher. While iPhone support is certainly convenient when writing a quick email, the iPad's large screen seems best suited for longer writing. Users who want to use the app for writing long pieces will probably wish to use a Bluetooth keyboard for faster typing. People using Bluetooth keyboards will also enjoy the ability to use keyboard shortcuts with the app. More keyboard shortcuts will be added in future versions as well. For example, in the future users with Bluetooth keyboards will be able to enter a key combination to quickly find all misspelled words. In all Voice Dream Writer has many superb features that can help writers with a wide variety of needs. Hopefully rich text editing and the ability to import Word documents will be added in a future version. Voice Dream Writer seems like it would also make a great Mac app and hopefully someday people will be able to use these features on their Macs. Even without rich text editing and Mac support, Voice Dream Writer seems amazingly polished and well thought through for a version 1.0 app. To purchase Voice Dream Writer for $10 on the App Store click here. The app will be on sale for $8 until Sunday, February 1, 2015. If you�re still unsure about the apps features watch the video below in which Winston Chen, the developer of Voice Dream Reader and Voice Dream Writer, walks viewers through his latest app.